When creating a project tool, it may be appropriate to dynamically create a list or library for each project. This is especially appropriate for large projects. Typically this is done manually by an administrator in the site. This is another case where Infowise provides a method to automate this action. The library can be named dynamically based on the data created by the user in the add form. Set the action to occur only for the add form. 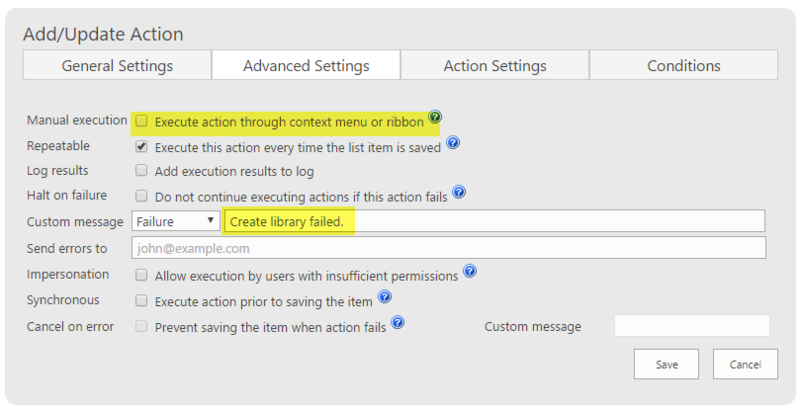 If necessary, use the impersonation setting so that the library can be created by all users. Use a dynamic value for the library Name which corresponds to the new list record. No conditions are needed. This should be creted once on the new form. Usually you should not use the Quick Launch option. This is another example where automation can replaced what is typically done manually by users. Share lists and document libraries can sometime lead to problems where users my step on each others toes or get confused when there information is mixed together. Creating an independent document library pertaining to each project record provides a structure that can eliminate these kinds of "shared resources" problems.